Not to be outdone by its South Korean rival, LG Electronics has unveiled a virtual reality headset of its own. In partnership with Google, LG is running a promotion called VR for G3 in which it plans to provide the headset to buyers of its LG G3 smartphone free of charge. Samsung’s Gear VR headset, meanwhile, retails for $199. 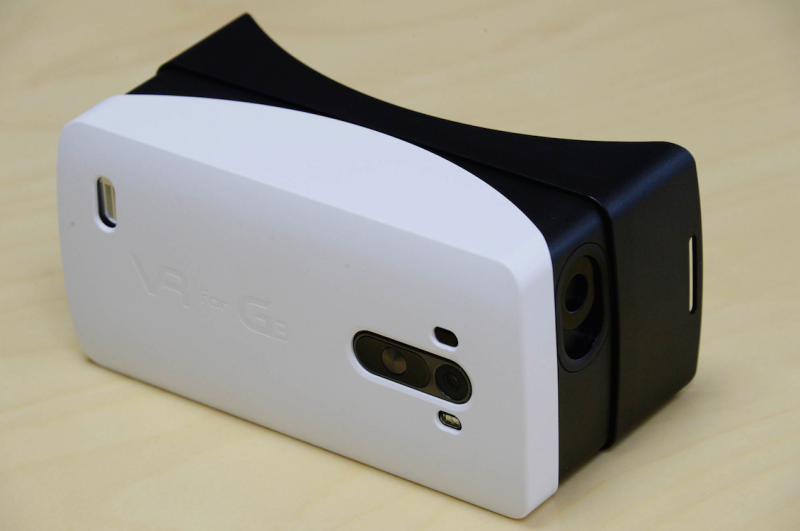 The design of LG’s solution is based on the blueprint for Google Cardboard which means it works with Google’s VR software and is compatible with any third-party apps made for Cardboard. It’ll operate much in the same way as Google’s solution with lenses built into the plastic chassis and a magnetic ring controller. Buyers can also get a free downloadable game called Robobliteration by using the in-box QR code. Much like Samsung’s solution, VR for G3 uses the processing power, sounds and visuals of its flagship smartphone to power its virtual reality solution. The setup can be used with the phone’s 1W speaker or paired with a Bluetooth headset for private use. Chris Yie, vice president and head of marketing communications at the LG Electronics Mobile Communications Company, correctly pointed out that we are at the beginning of the virtual reality movement which until recently was expensive and inaccessible to everyday consumers. LG said the promotion will roll out starting this month in select markets.